I’ve never tried partially roasting them on the grill and then frying, but I will. Can’t wait to see the difference. The oven bake does the cooking. The wings are actually done at this point, so the deep fry does the crispy thing without overcooking them. It’s our favorite way to get them done in the kitchen. Having said all that, I’d much rather finish them on the grill, but it’s just too freakin’ cold here on the coast in Maryland to grill anything. Nor’easter Part II coming up! I didn’t see any mention about the oil temp before frying…what should it be at? Thanks..looking fwd. to trying this method…Doug. Let me know how they turn out! And don’t forget the parchment paper. What a labor saving trick that is! Thanks! We don’t have a lot of room in our kitchen for a really decent fryer, but I would LOVE to have one, especially after having done our second annual Week Of Wings!Check out our latest posts! Delongi makes a decent fryer I want to get one of those when I have the money I like the digital thermostat and thanks I like your recipes too I am working on posting something every day or at least 3-5 times a week. First I’ve ever heard of a three step process, it is all too easy to overcook wings in the deep fryer. 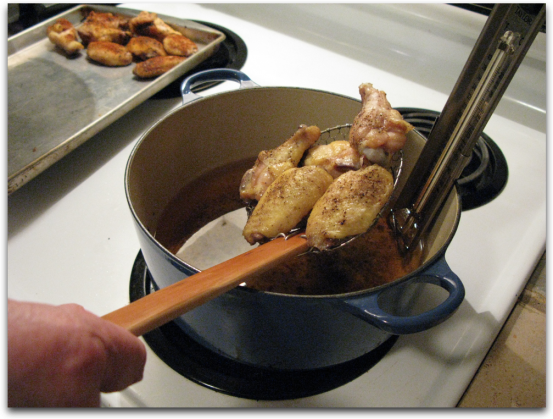 However, you don’t mention how long to fry the wings in oil. I’m assuming it’s a brief time, only a few minutes? You mention preferring to finish these on the grill. Do you oil the wings before grilling? dry rub again? Sauce at the end or baste during? I like putting the wings in a dutch oven, covering with oil, heating on stove to 200, keeping it there for 20 minutes, removing them and refrigerating until needed up to 3 days. That’s how I par-cook. I then grill them over high heat using various recipes. Haven’t found one I love yet but the classic Franks/Butter is good but I prefer a dryer wing. David, I guess it depends on what sauces or rubs we are using. If a rub, I do like to throw more on the wings before grilling. 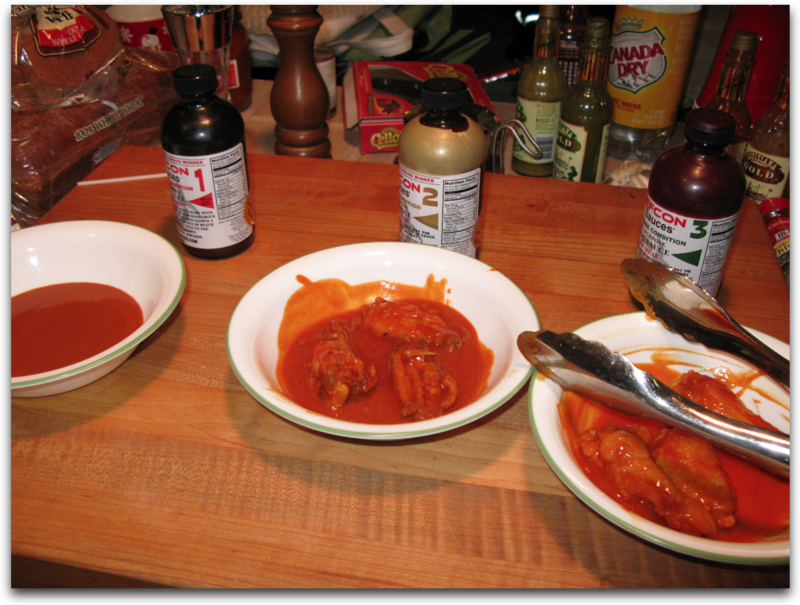 If a sauce, no, the wings are still moist from baking. 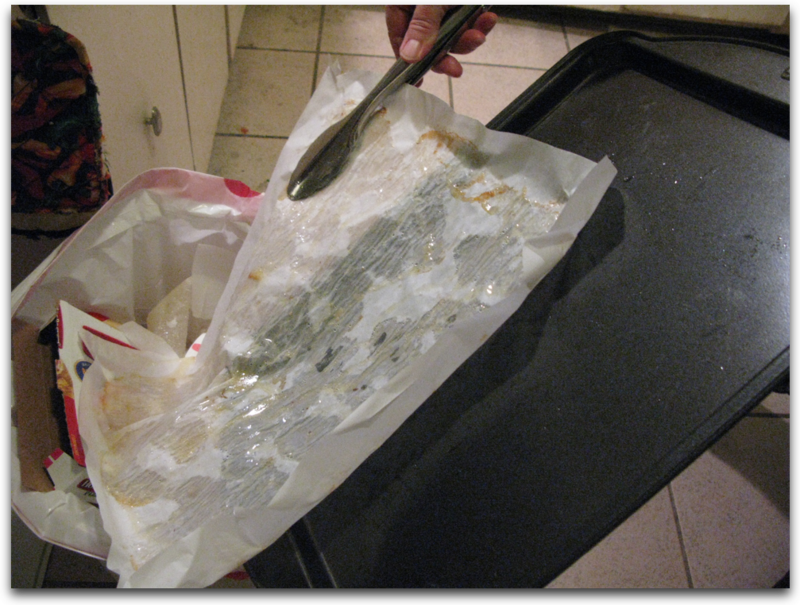 We’ve not considered your excellent suggestion of pre-baking, then refrigerating until needed. Then I guess we would oil them up a bit before grilling. While you mention “par-cook” in your method, we prefer to “almost-cook” in the oven. Then grilling would be minimal in time spent. I would think par-cooking in the Dutch oven would yield wings that are damp and not of a nice texture… but I’ve never tried it, so I won’t knock it. Thanks so much for your reply. I’ll look forward to Week of Wings IV in January. If you decide to try the methodology I mentioned pre-cooking in low temp oil you can get more detail by reading the Serious Eats article called “The Ultimate Extra-Crispy Double Fried Confit Buffalo Wings”. I will be trying this method. Thanks for the link and suggestions. Looks very scientific. If it yields crispier wings, I’m all for it! Again, thanks David. 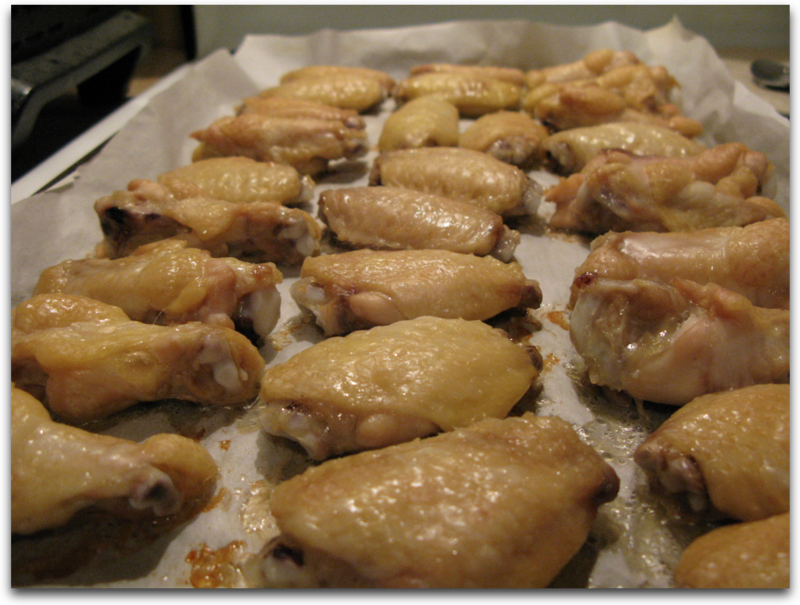 What if you coated the wings in a flour spice mixture, backed as you say and then deep fry? Seems like it would be a crispier wing. What do you think?